All provinces/territories permit unregulated child care outside the child's home up to a maximum number of children; unregulated care arrangements are legal and permitted so long as they don't exceed the maximum number of children. The legal number of children allowed in unregulated child care is specified in provincial/territorial legislation, regulation or guidelines. Some jurisdictions have additional age specifications and several allow some unregulated group (centre) programs under some circumstances, for example for a limited number of hours a day. 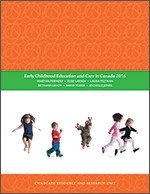 This BRIEFing NOTE provides an overview of provincial/territorial guidelines for unregulated child care outside the child's home.